Chances are you can find fresh blackberries pretty easily in your local market. But black raspberries (Rubus occidentalis) are a different story. And they are worth seeking out. All berries are good sources of antioxidants but black raspberries take top prize. According to Oregan State University Department of Food Science and Technology they contain almost three times the antioxidants of blackberries and more than six times the antioxidants of red raspberries. They are also extremely high in anthocyanins, the antioxidant compounds that give purple foods their rich, unique color. And they are rich in ellagic acid, a powerful anti-cancer, anti-viral, and anti-bacterial compound. In a minute you’ll see how to tell a black raspberry from a blackberry in your market. But first here are six amazing and proven benefits of black raspberries. In a study published in the journal Nutrition 45 pre-hypertensive patients were randomized into three groups. One group was given a capsule of dried black raspberry powder in a moderate dose (equivalent to 1500 mg of black raspberries) every day. A second group received a higher dose capsule of the dried black raspberry powder (equivalent to 2500 mg of the fruit). The third group received a placebo. After eight weeks the high dose black raspberry significantly reduced 24-hour systolic blood pressure and nighttime systolic pressure compared to the controls. Laboratory studies show black raspberries inhibit a broad range of cancers. A recent pilot study was conducted in twenty Barrett’s esophagus patients. Barrett’s esophagus is common in people who suffer with gastroesophageal reflux disease and is associated with an increased risk of esophageal cancer. After six months of treatment freeze-dried black raspberries significantly reduced markers of oxidative stress and free radical damage. It also significantly increased markers of detoxification. Animal studies have suggested that black raspberries may inhibit the growth of oral cancers. Researchers from Ohio State University conducted a study to test the theory in patients with biopsy-confirmed oral squamous cell carcinomas. They gave 30 patients oral troches containing freeze-dried black raspberry powder. After about two weeks the researchers confirmed that the phytochemicals from the black raspberries were detected in the cancer tissues. In addition, black raspberry significantly reduced adverse gene expression of the oral cancers. They suggested that black raspberry may be effective for oral cancer chemoprevention. Black raspberry is known to improve vascular endothelial function in patients at a high risk for cardiovascular (CV) disease. Just this year in a study from South Korea, researchers tested the short-term effects of black raspberry extract on endothelial progenitor cells (EPCs) and arterial stiffness in patients with metabolic syndrome. EPCs are derived from bone-marrow. They circulate in the blood and contribute to the formation of new blood vessels. They also help with the repair and maintenance of your vascular system. Researchers randomized 51 patients into either a black raspberry group or a placebo group. They found that after 12 weeks the use of black raspberry significantly increased circulating EPCs, lowering cardiovascular risk in patients with metabolic syndrome. In laboratory studies black raspberries have been shown to have beneficial effect on glucose (sugar) and lipid (fat) levels. In another study from South Korea researchers looked at the effects of black raspberry extract on pre-diabetic patients. In a randomized, double-blind, placebo-controlled trial 44 patients were divided into three groups. One group received a low dose (900 mg per day) of black raspberry extract. A second group received a high dose (1800 mg per day). The third group received a placebo. After 12 weeks the results indicated that black raspberry extract had beneficial effects on glycemic control and vascular inflammation in pre-diabetic patients. Diets rich in fruits and vegetables have been reported to be inversely associated with colorectal cancer risk. And in a lab, black raspberry has been shown to have antiproliferative effects on colon cancer cells. A recent study in Cancer Prevention Research looked at the effects of black raspberry in 28 colorectal cancer patients. 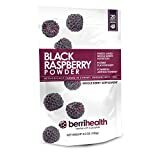 Researchers gave the patients 20 grams of freeze-dried black raspberry powder mixed in water three times a day for one to nine weeks. Then they examined plasma and urine samples for changes. The results suggested that black raspberry operates in several beneficial ways to help colorectal cancer patients including by altering amino acid metabolism, energy, and lipid metabolism. It takes a little practice to recognize a real black raspberry from a more common blackberry. Both berries come from the same genus and family so the resemblance is strong. But in general the black raspberry looks very much like a red raspberry only black. They have a hollow core and aren’t really shiny. Blackberries on the other hand are generally much larger and have an elongated shape. They also have a very shiny skin. The taste is different too. Blackberries can be tart while black raspberries are more fruity. Black raspberries are native to North America but the season is very short – typically just the first three weeks of July. The rest of the year you can find frozen or freeze-dried berries, as well as black raspberry jams. © February 2017 GreenMedInfo LLC. This work is reproduced and distributed with the permission of GreenMedInfo LLC. Want to learn more from GreenMedInfo? Sign up for the newsletter here. Disclaimer: This article is not intended to provide medical advice, diagnosis or treatment. Views expressed here do not necessarily reflect those of GreenMedInfo, Natural Blaze or their respective staff.